Many prominent researchers have established the foundation for the theory of a stem-cell origin of cancer, and they’ve performed vital experiments to support its validity. 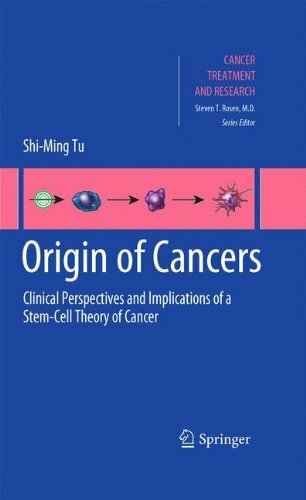 This book illustrates how this theory may transform our current understanding of cancer. This book highlights the current state of the art in single cell analysis, an area that involves many fields of science – from clinical hematology, functional analysis and drug screening, to platelet and microparticle analysis, marine biology and fundamental cancer research. This book brings together an eclectic group of current applications, all of which have a significant impact on our current state of knowledge. The authors of these chapters are all pioneering researchers in the field of single cell analysis. The book will not only appeal to those readers more focused on clinical applications, but also those interested in highly technical aspects of the technologies. All of the technologies identified utilize unique applications of photon detection systems. This book provides a comprehensive update on the latest information and knowledge which emerged from translational and basic science research endeavors, targeting the regeneration of salivary glands. The coverage includes salivary gland growth and development, stem cell therapy, bioengineering of salivary glands, and perspectives on and practical approaches to restoration of secretory function. More specifically, among the individual topics addressed are the various types of stem cell of value for cell replacement therapy, technological advances with respect to 3D printing, gene therapy, organ culture of salivary glands, and surgical aspects of the feasibility and practicality of transplantation. Readers will find helpful practical guidance on functional restorations of damaged salivary glands and stimulating insights into potential future directions in salivary gland regeneration research. The authors are all acknowledged experts from a range of academic and clinical backgrounds. Accordingly, the book will be of interest not only to clinicians, such as general dental practitioners, oral medicine specialists, and surgeons who manage dry mouth patients, but also to biomedical engineers, stem cell researchers, and transplant surgeons.